On 12 October 1794, Thomas Small reported to Alexander McKee of the British Indian Department that a rifleman called Porter, “native of Pennsylvania,” had been brought to McKee at Swan Creek. The Americans and the British were still engaged in territorial hostilities up until 1796. The man Porter had information about The Glaize (Indian confederacy headquarters; now Defiance, Ohio) and Fort Defiance. Porter was to be transferred as a prisoner under the care of “Tuscarora George” to Brownstown where Upper Canada’s Lieutenant Governor Simcoe and McKee were due for a meeting with Indian allies. Simcoe had left Newark on 17 September for Detroit and points south to attend. Brownstown was in today’s Wayne County, Michigan, across the river from Amherstburg, Upper Canada. We don’t know this Porter’s first name. After his meeting of 1794 with a reported 2,500 Indians, Simcoe returned to Newark at the end of October. Did Porter accompany Simcoe back to Newark? He was not described as a deserter on either side, so as a civilian perhaps he usefully redeemed himself. Riflemen and other frontiersmen were frequently familiar with Indian tribes and languages. Could he have been hired by military commander Colonel Gordon at Newark after this incident in October 1794? That is, could he be the George Porter later jailed in 1814, or related to him somehow ... the George Porter who was associated with Indians in the western district? He was unlikely to be our George the Carpenter who in 1794 was building his first house in York. There is no George Porter as a head of household in the 1790 census of Pennsylvania. Lebbeus Porter first appears in Newark in 1795, requesting an Upper Canada land grant. He is described as a blacksmith in various documents. On 29 December 1799 he married Ann Adams in Newark. By 1800 he had received a grant in Oxford Township (“Oxford on Thames”) but was having a conflict of claims with Ebenezer Cook. In 1802, he was living in Queenston along the Niagara River. The dispute re land ownership must have been resolved, because Lebbeus sold the south half of lot 15 concession 1 Oxford West Township in November of 1805, when he was a resident of Onondaga, New York. After that, he seems to disappear from the Upper Canada scene. He was apparently one of the petitioners to establish a Masonic Lodge in Salina, New York, in December of 1807. If Internet dabbles are to be believed, men called Lebbeus—and yes, there are several of them—are accounted for in families that expanded from Connecticut and Massachusetts. Superficial exploration does not reveal a Lebbeus with a brother George, nor a space on the multi-branch Porter family tree this particular man would fill. Yet his presence on the Canadian side of the Niagara River coincides closely with George Porter the Carpenter. Lebbeus’ marriage date could mean he was a contemporary in age. So it’s a distant possibility that Lebbeus’ family origins could be George’s origins, probably being no closer than cousins. Nevertheless, George the Carpenter still does not “fit” into known New England families. A weak and undeveloped hypothesis but perhaps deserving of more attention. NEXT Persons of Interest: The Surveyor! The Doctor! (... hiatus in series till further notice). E.A. Cruikshank, The Correspondence of Lieut. Governor John Graves Simcoe (Toronto: Ontario Historical Society, 1931), vol. 5, 113-114. Cruikshank was citing Claus Papers, vol. 6, 229-231. Upper Canada Land Book A, 1792-1796, p. 232; LAC microfilm C-101. Dan Walker and Fawne Stratford-Devai, Vital Records of Upper Canada/Canada West, Vol. 1, Part 2, Niagara District, 1792-1849 (Delhi, Ontario: NorSim Research and Publishing, 1999), 114; citing St Marks Anglican (Niagara-on-the-Lake, Ontario) register of baptisms, marriages and burials,1792-1815. The original register is also available on AO microfilm MS 545 reel 1. Upper Canada Land Petition, P bundle 5, no. 54, Lebbeus Porter; LAC microfilm C-2489. Upper Canada Land Book D, 1798-1802, p. 775; LAC microfilm C-101. Oxford County Deeds, Old Series, nos. 100 and 101, Porter to Nichols; AO microfilm GS 2458. R.W. Gary Heinmiller, History of Masonry in Onondaga County (http://www.onondagadistrict.org/History.htm : accessed 18 June 2010). Joseph W. Porter, A Genealogy of the Descendants of Richard Porter, Who Settled at Weymouth, Mass., 1635, and Allied Families (Bangor, ME: Burr & Robinson Printers, 1878), digital images, Google Books (http://books.google.ca : accessed 19 June 2010). This post isn’t so much about the ancestors per se as it’s about frenzied preparations for two days of research at General Register House in Edinburgh. That’s the one at the east end of Princes Street. As opposed to the one at the west end of Princes Street, imaginatively called West Register House. NAS. National Archives of Scotland. My hotel is thankfully nearby, as memorized from a colourful and distracting street map, so I calculate a maximum 10? minute walk after breakfast heading east. No dallying at shop windows along the way. Anticipation of an adventure, they say, is half the fun. Who said that, anyway? It may be the only fun. Time constraints allow for two days at NAS, within the specified hours of 9 a.m. to 4:45 p.m. Every minute is precious. Who knows how much time is eaten up with registering (passport type photos required), orientation, filling out forms, and waiting for retrievals and printouts. Never mind the important in-between part of computer and microfilm searching. My primary research goals are at the one facility. I pursue Donald McFadyen relentlessly in the perhaps mistaken hypothesis that he served in a militia unit during the 1790s. A previous search of the Breadalbane Muniments was negative, so I apply myself to the collections of the Earls of Airlie and Maclaine of Lochbuie. There are muster and pay rolls for the Breadalbane Fencibles and the Argyllshire Volunteers among them. Somewhere among the meters-long shelving of estate papers. White gloves time, I believe. My Frasers will receive some attention at GRH since my little expedition has been ordered to make an ancestor detour to Killin in Perthshire. Cousin Lizzie paved the way for me—metaphorically speaking—into a village that may have looked like this when our mutual Duncan Fraser (1783-1867) was the village blacksmith. 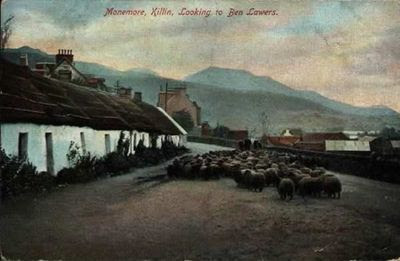 Monemore Cottages, Killin, Perthshire; postcard. I go to GRH armed with specific catalogue references. One collection alone took two days of trawling the online finding aid through hundreds of items. This is the fun part? Not that I’m complaining ... thank you, gods of the NAS for the finding aids! The kinks in my neck and shoulder muscles should recover just in time to assist my pilot in keeping the transatlantic Airbus aloft for seven hours (Monty Python helps ... “Always look on the briiight side ...”). My confidence is still a little shaky that I will understand the accents and vernacular of the native Scots. More archival time eaten up if I embarrass myself by asking them to repeat what they said several times. Or I could pretend to get it the first time, and proceed as if transmission went well. That usually lands me in some hopeless or hilarious (in hindsight) contre-temps but then again it could be a good diversion from intensive, eye-crossing research. Edinburgh is really the only place on the itinerary that demands absolute research discipline. But only until 4:45 p.m.! What then? The map is mesmerizing. It promises historical sites of sin, depravity, and ancient murder mysteries. Whisky tasting and tartan weaving. Greyfriars Bobby. Campbell’s Close. Grassmarket. Deacon Brodie’s Tavern? Malt Shovel Inn? Ahhh ... the Hebridean Bar; surely a place for Celtic music. Dominic Beddow and Claire Littlejohn, The Illustrated Edinburgh Map (Harper Collins Publishers Ltd., 2007). Now that I’ve put myself on the published record, we know there must be follow-up. The netbook may or may not decide to obey me but I have Luddite backup. The adventure will unfold, as my granny never said but someone’s did, the good Lord willin’ and the creek don’t rise. Being translated means Icelandic volcano, hold your temper, eh? I mean aye. My previous post here outlined my ancestor identification problem, despite having a rather serendipitous resource to work with. For those who have satisfactorily identified an ancestor in the 1776 list for the Isle of Coll, a bigger leap is back to 1716, the next list (of adult males). That’s a duration of sixty years, about two generations. How likely is it that an adult male in 1716 would be present in 1776? Um ... only if he were about 75 years old or over, right?! More likely that one of the McFadyens in 1716 was the father or even the grandfather of one of the parent candidates of 1776, of my Donald-the-pensioned-soldier. Lachlan (1798), Angus (1801), Roderick (ca.1802), Hector (ca.1809), John (1816), Donald (ca.1818). • Charles Roy (ruadh) at Ardnish. All of these men were located in proximity to the Maclean castle stronghold, supporting their historical allegiance to Maclean of Coll and some, no doubt, members of his traditional bodyguard. What can I tell from this list? Going by naming customs alone, one of those four men (in bold) could be my Donald’s grandfather, or even great-grandfather. The names Hugh and Charles did not pass down in my line. None of the three candidates for Donald’s parents in 1776 lived in one of those mentioned townships, and one candidate was deceased at the time, forever un-named. Because parish recording virtually begin in 1776, there is no way to attempt true analysis in the depths of the eighteenth century. The fragments of parish entries 1733-1735, when patronymics were still being used sporadically, are not of help. Trying to make rational hypotheses in eighteenth century Collach families is where the proverbial brick meets wall. Too many gaps for reasonable connections. Some of that vaunted Highland oral family history would be welcome right about now. Oh, where to find a genuine McFadyen sennachie? Nicholas Maclean-Bristol, editor, Inhabitants of the Inner Isles Morvern and Ardnamurchan, 1716 (Edinburgh: Scottish Record Society, 1998), 164-166. The source of the list is in Sheriff Court Records of Argyll, SC 54/22/54, National Archives of Scotland. Maclean-Bristol, “Special MacFadyen Issue,” West Highland Notes & Queries, Series 3, No. 5, November 2002, 4.